There is nothing more relaxing than admiring the magnificent beauty that is found in nature. There is a certain serenity that comes from being outside and exploring the world around you. You do not always have to travel far in order to be immersed in the great outdoors; you can enjoy many of the same benefits from the comfort of your own home. Even if you do not live close to a wooded area, incorporating bird feeders near large windows or an enclosed patio in your home can provide you with enjoyment year-round. The wide array of birds that will visit are not just entertaining, but educational as well. Unfortunately, other animals can make it difficult to attract birds. While squirrels are fun to watch, as they frolic from tree to tree and chase each other, they can destroy your bird feeder, steal your bird seed, and scare off your feathered friends. Investing in a quality squirrel-proof bird feeder can allow you to enjoy all that nature has to provide. While many bird feeders claim to be squirrel proof, very few actually are. So how do you know which one to choose so you do not waste your money? 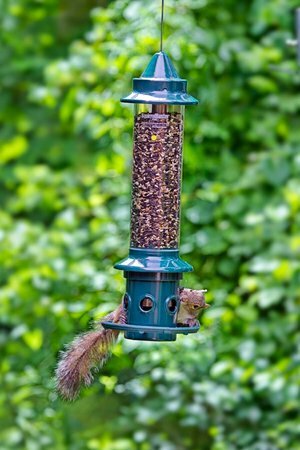 There are several good options available, but one of the top-rated bird feeders on the market is the Brome 1024 Squirrel Buster Plus Wild Bird Feeder. The Squirrel Buster Plus is sturdy enough to accommodate a wide variety of birds, large and small, while remaining squirrel safe. The price is comparable to similar products, and its high-quality and ease of use make it well worth the cost. 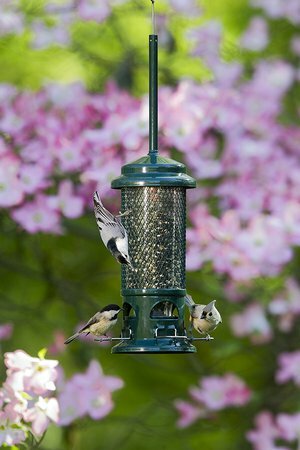 The feeder can hold three quarts of bird seed, eliminating the need for frequent refills. It has six feeding stations, and each perch length is adjustable to attract birds of all sizes. This model, with the Cardinal Ring Design, was designed specifically to attract Cardinals. Cardinals have short necks, so they prefer to face their food source. They also require a thicker perch. The simple design of the Squirrel Buster Plus allows the feeder to be easily taken apart for cleaning, and it is dishwasher safe. The waterproof vents in the bird feeder keep the seed fresh and dry, minimizing the risk of spreading disease to wildlife. Brome guarantees the product’s effectiveness, and it comes with a lifetime warranty. The design of these wild bird feeders makes it difficult for squirrels to get a foothold. However, squirrels are very clever and adept at getting into various food sources. The Squirrel Buster Plus is designed to close the feeding ports when it is triggered by a certain weight (and you can adjust this). The factory setting will trigger the closing mechanism at four ounces, the weight of a small Red Squirrel. You can adjust the weight requirements either up or down to meet your specific needs. The important thing to remember is that you want to make sure that if a squirrel goes for the feeder it can't reach from something else (holding its weight) and get at the feeder. Make sure you set it up so that if a squirrel wants to get at the food it has no choice but to climb onto the feeder to do so. For this reason, it is important to leave an 18-inch clearance around the feeder. One of the biggest advantages of the Brome 1024 Squirrel Buster Plus is that it not only keeps out pesky squirrels, but the weight setting can be adjusted to keep away larger birds that may be seen as a nuisance, such as blackbirds and starlings. As stated previously, it can hold a large amount of food and is designed to protect the birds from disease. Another important feature is that the safe design keeps out squirrels without harming them. The Brome is also easy to fill. This versatile product has received rave reviews and was named Best New Product by Birdwatch America. The only real drawback to this system is that it may take time for some birds to get used to having to stick their head into the feeder to retrieve the seed. However, many other birdfeeders have a similar design and have been successful at attracting and feeding birds. Larger birds may also trigger the closing of the feeding hole and you will need to keep an eye out to make sure you have set the right tension. If the price of the Brome Squirrel Buster Plus is more than you want to spend on a bird feeder, then you may consider purchasing the Standard instead. 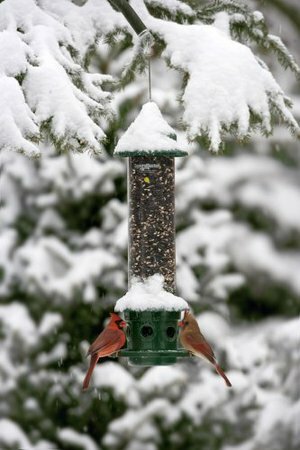 If you are in an area with fewer birds or don’t mind filling up your feeder more often, this may be a more cost-efficient option for you. It only holds 3/4 quarts of bird seed and does not include the Cardinal Ring System, but it is only half the cost while still being squirrel resistant. It still has the ability to accommodate both passerines (aka. perching or songbirds) and clinging birds such as a nuthatch. The Standard has a negative-grip metal shroud around the seeds that closes off the feeding ports when enough weight is applied. It does this through a spring that can be adjusted at the bottom of the unit to provide the right amount of resistance for the birds while still closing up if a squirrel decides to go for a bit of a snack. Bird watching in your own backyard can bring a sense of peace. Listening to the chirps and songs a wood thrush while reading a favorite book is such a fantastic way to pass the time, but it can be frustrating if a squirrel or two, or three, has found your feeders and proceeds to binge on them regularly. 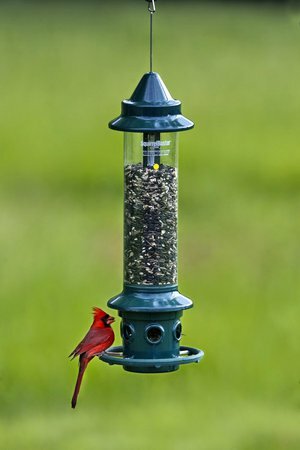 So, if you love wild birds and are tired of feeding all those pesky squirrels, make sure to check out these fantastic squirrel proof bird feeders and let us know what you think!